I have just stumbled upon Google trends web site that can show how the search terms change over time. I thought it would be very useful to check how WPF is working (is it really dead?). As you can see the worldwide search amount for WPF has decreased a little bit in the last 2 years, but it is still very high. Also its comparison with WinForms and WinRT shows that is used very much. Especially WinRT search volume shows that this was a big fail for Microsoft. 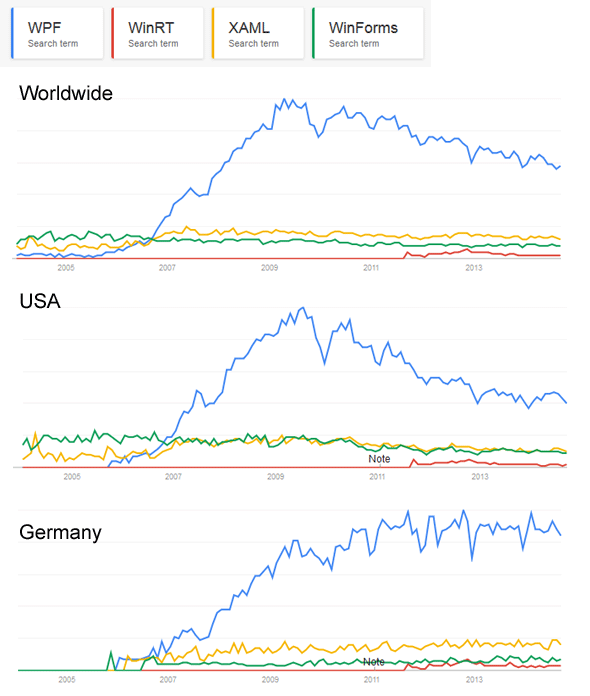 The differences between the countries are also interesting - the decrease of WPF usage was quite high in US, but in Germany WPF search indicates that is still used as much as in its best times. For me this is very surprising. I was not expecting so much search volume for Silverlight. Maybe the reason for that is that users how build WPF or WinForms applications are many times searching for with .Net or c# search term, but when they search for Silverlight, they use this keyword more times because of the differences between standard .Net and Silverlight's version of .Net. Licensing model and prices are going to changes on 1st June 2009. Basic Viewer application license will provide basic converter application. Professional Viewer application license will provide fully featured converter application. Basic library license will contain the conversion library (Reader) with basic functionality that could be used in your own applications. The basic Viewer application will be also included. Professional library license will contain fully featured conversion library (Reader) that could be used in your own applications. The Professional Viewer application will be also included. If you will only need to convert a few svg files into xaml for your Silverlight application, you will choose Basic ViewerSvg Application for $79.00. If you need to read dynamically generated svg files in your WPF application, also need to get object names defined in svg file and other advanced features, the Professional ReaderSvg library for $399.00 will be the best choice. So the new licensing model is much more flexible. It will be possible to buy basic converter applications for much lower price and complete converter solution with library for higher price. The preview of the new licensing model with detailed features information can be seen on the new purchase page. Until the 1st June 2009, all the purchases can be still done on the current purchase page. On the 1st June 2009 the page will be upgraded to support new licensing model. The owners of the current licenses could still use all the features of the pro library license and could also get all the updated just as having the pro library license. This means that if you need the pro library license, now it is the best time to buy the library because you will get the pro library features for much lower price. But if you only need a simple converter application, it is worth waiting until the 1st June. Finally, I would also like to invite you to sign up to receive tweets from my Twitter profile for the latest news concerning tools and libraries on www.ab4d.com.